Be the first to share your favorite memory, photo or story of Tennis. This memorial page is dedicated for family, friends and future generations to celebrate the life of their loved one. 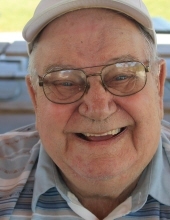 Arnold Larson, 90, of Huxley died August 15, 2018 at Bethany Manor in Story City. Funeral services will be Monday August 20 at 10:30 am at Fjeldberg Lutheran Church in Huxley. Burial will be in the Roland Cemetery. Visitation will be Sunday from 3 to 5 at Bethany Manor. Tennis Arnold Larson was born on February 6, 1928 in Austin, Minnesota to Tennis August and Mabel Anna (Brodie) Larson. He married Vivian Neriem on November 6, 1948. Arnold farmed for many years, owned and operated Larson Plumbing and Heating in Huxley for over 30 years and also worked as a plumber at Iowa State for 23 years. He was a member of Fjeldberg Lutheran Church where he sang in the choir, was a confirmation mentor and served as a deacon. Arnold was active in Gideons and Cursillo. He enjoyed fishing and camping. Arnold is survived by his wife Vivian of Story City; two sons, Dennis (Dawn) Larson of Perry and David (Lorraine) Larson of Colo; two daughters, Susan (Dean) Tjornehoj of Tulare, CA and Julie (Eric) Bogenrief of Branson, MO; nine grandchildren and 10 great grandchildren. He was preceded in death by his parents; a granddaughter, Heather Dawn; a great granddaughter, Ella Daymude and two sisters, Mary Jean Anderson and Carol Tyler. To send flowers or a remembrance gift to the family of Tennis Arnold Larson, please visit our Tribute Store. "Email Address" would like to share the life celebration of Tennis Arnold Larson. Click on the "link" to go to share a favorite memory or leave a condolence message for the family.